The University of Miami, home of the Hurricanes, and better known as “the U,” is located south of Miami in the historic enclave of Coral Gables. This private university of 11,000 undergrads and 5,000 graduate students is a gorgeous spread of manicured green lawns and spacious sidewalks, banyan trees, palms, and lush, deep green vegetation. Wednesdays are a great day to visit – there’s an incredible farmer’s market on campus with lots of yummy ethnic food stands! Miami is known for its diverse and integrated community; students hail from 50 states and 121 countries, and 14% of the student body is international. While there is a big sports culture on campus, the students are also engaged in their academics. UMiami has 11 schools and colleges with over 180 majors. They also offer the option of customizing an independent major. Many students double major, and it is completely doable. The largest classes – freshman year introductory classes – generally have about 75 students, and they were introductory level classes his freshman year. The student-to-faculty ratio at UM is 12:1. After the intro level courses, classes average 17 – 20 students. 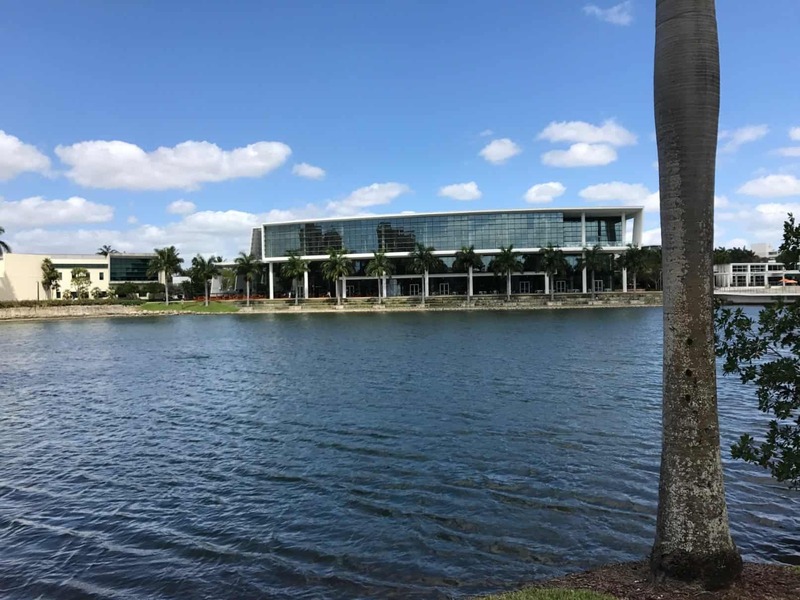 University of Miami has a very strong engineering program with about 1100 undergraduates majoring in a wide variety of engineering disciplines and concentrations. Classes average 16-20 students in the first two years, but are as small as 6-7 in the upperclass years. Internships are not required, but a design project is; engineering students may work alone or in groups on projects they pursue with faculty supervision and then present to faculty and industry representatives at a black tie affair! Engineers can pursue a BS/MS in five years, and about a quarter of Miami’s engineering students study abroad at some point during their time here. Miami’s Cognate Program is unique. Through this general education system, students are required to choose three interrelated courses, within in each of the traditional areas of study (STEM, People and Society, and Arts and Humanities). This allows each student to personalize his/her education, delve deep into an area of passion, and experience a broad understanding of the topic or theme s/he has chosen. The arts programs at University of Miami are a vibrant choice; the School of Arts & Sciences offers BFA programs in acting, stage management, design, theater management and musical theater. There’s also a BA program in theater arts, which does not require an audition (the BFA programs all require either an audition or portfolio). The Frost School of Music has highly-respected options in music and vocal performance, as well as different disciplines in the entertainment and music industries. University of Miami offers study abroad opportunities at 85 locations in 40 countries. Programs are designed and taught by UM professors, allowing all credits to transfer. Study abroad programs are also supported with scholarships as well as other financial aid. The school has a substantial career center that provides assistance with resume building, interview skills and internship opportunities. It’s completely realistic to expect to land a job as a research assistant as early as your freshman year. 94% of students land a job or acceptance to grad school within 6 months of graduation. About 30% of the students are involved in fraternities and sororities – there are fourteen national fraternities (four with houses) and eight national sororities (sororities don’t have houses – instead, each sorority has a designated space in the Panhellenic House where they hold their meetings). Miami has Division 1 sports, fielding 17 varsity teams. Additionally, they have an extensive array of club and intramural teams. Miami’s Wellness Center is spectacular, with a wide variety of fitness classes, the 3rd floor indoor track, the pool and racquetball courts. All freshmen are assigned to one of two high rise residential colleges, which are co-ed by floor. The dorms are situated near a huge playing field where students are free to run or frolic as they wish and definitely encouraged to participate in the annual Freshmen Sports Fest Rivalry. As the tour guide shared, “it’s the freshman bonding experience.” 50% of students continue to live on campus all four years. Miami’s admission is competitive, with approximately 38% of the nearly 32,000 applicants accepted. Roughly 2,100 students make up the freshman class. The admitted class has an average unweighted GPA of 3.7, and the following middle-50% test scores: SAT CR 600-690; SAT M 620-730; ACT 28-32. However, admissions are truly holistic, say admissions counselors. 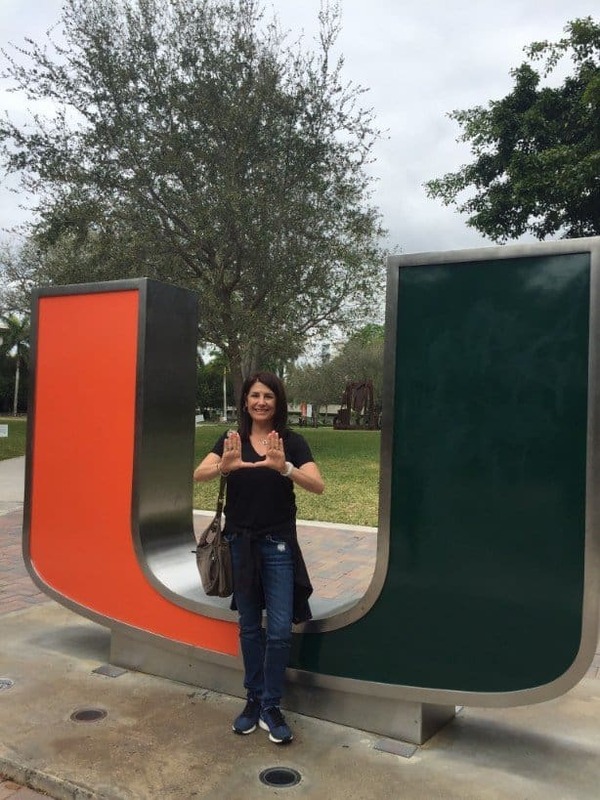 “University of Miami admissions staff look closely at school curriculum and other data to identify students that are truly challenging themselves. 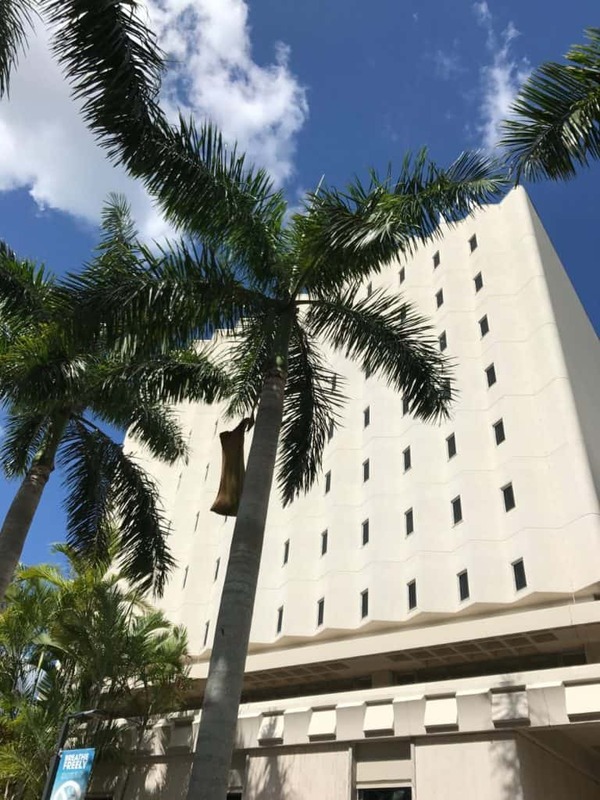 We look for high involvement and responsibility in the recommendations as well as the personal statement.” Miami is not interested in contrived stories. They want to read an essay written from the heart. “It’s the one part of your application you have control of.” Miami offers two binding Early Decision plans. UMiami President Julio Frenk set a goal of the university meeting 100% of demonstrated need. They are aggressively working to meet that goal and applicants are encouraged to apply EA or ED for greater scholarship opportunities. Both the FAFSA and CSS are required. Overall, the University of Miami environment caters to the well-rounded student, serious about his/her studies and a path toward a career. Students here balance school spirit, involvement, academics, and community service/leadership, and seem to have a bounce in their step as they talk about their double majors, where they studied abroad, their research role or upcoming internship, and cheering on the ‘Canes at the Miami Dolphin Hard Rock Stadium. The grounds at University of Miami are lush and beautiful, with many water fountains and multiple bodies of water. Debbie visited in 2016, Fay in 2017 and Evelyn in 2019. You can scroll through all of their photos here.